Nice Mug you have there. By the way, where did you get the mug? 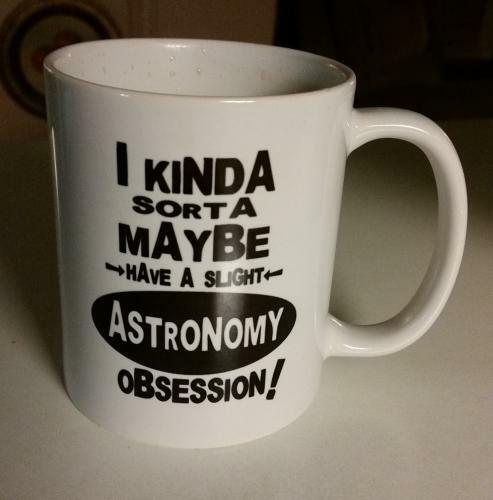 I need one that says, "I am a telescope collector, not a telescopaholic!" My wife gave it to me for Christmas. She ordered it online from some store on "Esty" I think. How many scopes do you have Bill? Oh, less than a couple dozen. Of the modern ones, 2 Infinity 60 (working them over now and comparing changes), Infinity 80, Infinity 102, Polaris 114, Polaris 130, LX 70-8R, LX 70-6M OTA, Lightbridge Mini 82, Eclipse 114, Lightbridge 12. Older ones: DS 2090, DS 2102 OTA (upgraded), DS 2114 (turned into an f/3.8 Rich Field Scope), DS 2130 (5 inch f/8 mirror), DS 90 OTA (upgraded), NG 70, ETX 80, Home built 14 1/4 f/6.7 on an old DS 16 equatorial mount. I used to have an LS 8 and a C-11 Advanced SCT....both stolen. Wow! What a collection Bill. I agree, you definitely need a cup! I have been a Meade fan for a while but have never had any type of dobsonian so when I got the chance to buy a 15" Obsession classic at a very good price I went for it.... when you start to push that baby around with its wheelbarrow handles... you realize that got an Obsession! Yes, I can understand that!